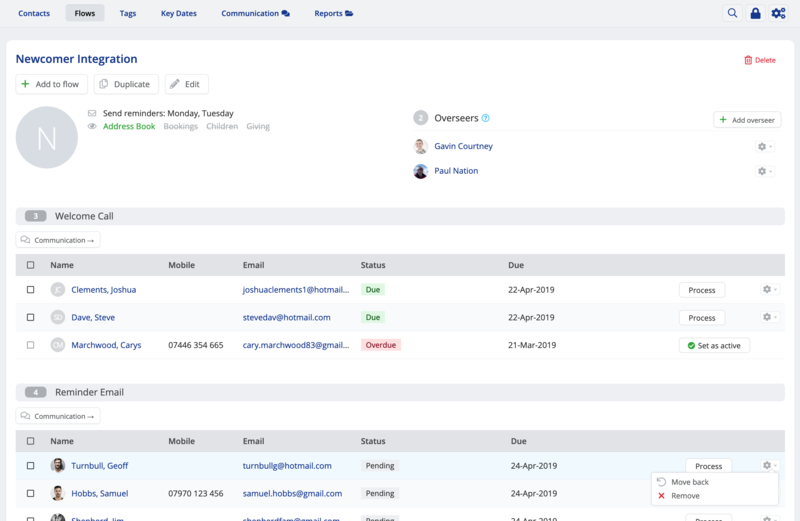 Flows are a powerful and incredibly useful feature within the Address Book, Children, Giving and Bookings modules that enable you to break down repetitive "people-processing" tasks into Stages; with each stage having pre-set Actions that can be processed for each person at that stage. You can also use batch actions to bulk-process a selection of people in a Flow stage. Actions that can be processed include everything from assigning and removing Tags, assigning Key Dates and Custom Field values, to sending Preset emails and SMSs and archiving people. Some actions are not available in some modules. In essence, Flows are the perfect solution to those unwieldy spreadsheets that we're all familiar with! Flows will help you and your team stay on top of each person's progress through the various stages of the Flow, sending reminder notifications when tasks become due or overdue. Users then have a choice - to complete their assignment by processing the Stage actions that are due, to postpone the assignment, or to delegate the assignment to another user - ensuring that no one falls through the cracks in your admin processes! Flows can be shared across other modules. When creating a Flow in one module, you can also set whether that Flow should also be visible in either of the other three modules; then, subject to a user's module permissions, the module they're viewing will determine which people in the Flow they can see and process. For example, you might set your "DBS (Safeguarding) Check" Flow to be visible in the Address Book and Children modules. People in either module can be added to the same Flow. 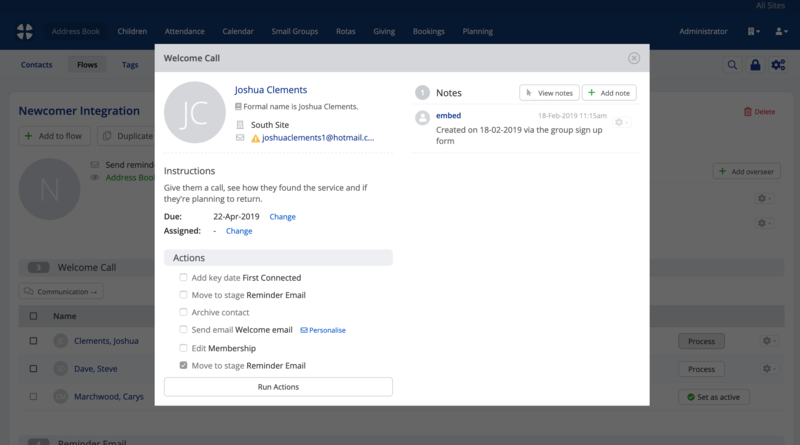 Then, in the Address Book your users will only see and process contacts through the Flow, but in the Children module they'll see and process children through the same Flow stages. In the remainder of this article we'll work within the Address Book, but the same principles apply to Flows in the Children module, the Giving module and the Bookings module. Within the Address Book, Children module, Giving module or Bookings module, click into the Flows section and click Add flow. Notice that there are a number of Example Flows that you can optionally install, perhaps to see what an example Flow looks like or to use as a starting point for your own Flow. You can optionally assign Overseer(s) to a Flow. Overseers can receive automated digests of Flow progress, keeping them in the loop of tasks that are outstanding, due and overdue. The Send reminders setting lets you choose which days of the week you would like those digest reminders to be received - perhaps not at the weekends, for example. Next, set the module(s) in which your Flow is Visible - for example, you may have a Flow that just needs to be visible in the Address Book - like "newcomer integration" - or perhaps your Flow is for children and Address Book contacts, such as a "DBS (Safeguarding check) Flow", or perhaps your Flow for "new giver follow up" only needs to be visible in the Giving module. You can change the modules that a Flow is visible in at any time. Note that Overseers are module-specific, meaning that you can assign different overseers for each module that a Flow is set to be Visible in. Be careful not to hide a Flow from a module where there are people from that module already in the Flow or where you are using an "Add to flow" action that will add both contacts and children into a Flow that is only set to be visible in just one module! By default, Flows are Visible to "All Users" with login permissions for the module in which the Flow exists - note this means "All Users", not "all members"! Optionally, the visibility of Flows can be restricted to one or more User Groups - see our related support article for further information on creating User Groups. Only users that are User Group members will be able to the access or use the restricted Flow. Finally, set the Flow Status to active - the system only generates automated Flow reminders for active Flows. Also, when using the Add to Flow functionality throughout ChurchSuite, you can only "Add to" active Flows. Active Flows can be Archived when they are no longer needed - an archived Flow can be set active again in the future. Warning - before you delete a User Group! Before deleting a User Group, consider whether any Notes, Tags or Flows have their visibility restricted to just the User Group being deleted. If you proceed with deleting the User Group, no other user (or administrator) will be able to access restricted-visibility items - they will be hidden from view. This is intentional in order to respect the original visibility restrictions that were intended to ensure privacy of those items. Therefore, before deleting a User Group, you may wish to update the visibility restrictions of your Notes, Tags and Flows - either to "All Users", "Just me" or to an alternative User Group. Once a User Group is deleted, only the ChurchSuite support team can restore the visibility of any content that has become hidden. You should also be careful when restricting the visibility of a Flow that is dependent on another Flow. For example, a Flow that has an "Add to Flow" action to process people from one Flow in to another Flow that has restricted visibility will cause issues to users who are not part of at least one user group that is being used for Flow visibility restriction. Flows are essentially a series of Stages, within which actions will be processed for each person in the Flow. When creating a new Flow, the first Stage is added for you - its called "Stage Name" - set a Stage Name that more accurately describes the purpose of that stage. Optionally add Instructions - the contents of this field are displayed to your users when they are processing people through this Flow stage - it's your opportunity for you to clearly explain what you would like your users to do. 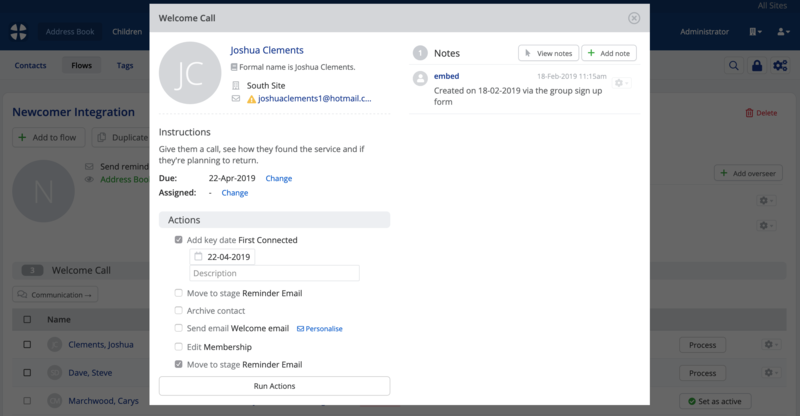 In the example below, the "Welcome Call" stage has user instructions for calling the person in the Flow to solicit some feedback about their first visit to the church. Assigning a Due date to the Flow stage will determine when a person's Flow progress changes from pending to due to overdue. The Due date is always relative to either the date the person is first added into the Flow, or relative to the date they are processed out of the previous Flow stage. Use the drop-down selectors to set the default Due date that those entering the Flow stage will inherit. When processing people through Flows you will be able to override the default due date, perhaps to postpone tasks. Next, optionally set an Assigned user. By default, Flow actions can be processed by any user with access to the Flow, however it is sometime helpful to designate a specific user to be responsible for particular Stages within a Flow. 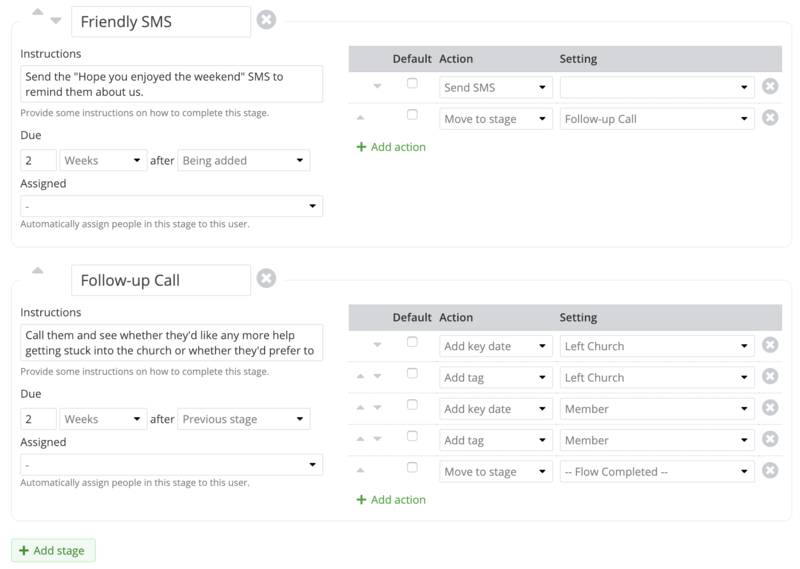 Any user Assigned to a flow stage will receive an email notification when their designated Stage actions become due. They'll continue to receive a daily reminder notification until the person is processed, or the task is delegated to another user, or the task is postponed. For example, you may have a user who has a particularly friendly telephone manner to whom you might assign the "Welcome call" stage of a newcomer integration Flow. In the next section of this article we'll look at how to add Actions to a Stage - you can skip down if you have finished adding all your Stages. Adding further Stages to a Flow can be done using the Add stage button located at the bottom of the list of Stages. Notice too that Stages can be re-ordered using the up/down arrow icons located to the left of the Stage name. You can delete a Stage from a Flow using the "X" button to the right of the Stage name. When adding or editing a Flow, a full list of Actions Explained is listed down the right-hand side of the page. Within a Stage select Add action to choose an Action from the drop-down list and the set any related settings for the selected action. Continue adding Actions to each Stage as required. Where multiple actions are added to a Stage, notice the option to re-order the actions, perhaps ordering them logically by grouping the most commonly processed actions to the top of the list. You can also set the Default state of each action in the list, perhaps so that commonly processed actions are pre-ticked for the user when processing people through the Flow, or leaving actions unticked by default where you expect the user to choose which actions to process for each person. It's important to remember that each Stage will require at least one navigation Action - otherwise users will be unable to process people into other Stages in the Flow. Typically, where a Flow follows a linear workflow you would include a Move to stage action for the next Stage, with the final Stage having a Move to stage > Flow Completed action - see example below. It may sometimes be helpful to add additional Move to stage actions to a Stage to enable users to process people into previous or later stages, perhaps skipping a stage or returning a person being processed to the start of the Flow - you have complete flexibility! You may find it helpful to create all your Flow stages before adding actions - you can't add a Move to stage action for the next stage if that next stage has not first been created! The Send email and Send SMS actions can be used for sending Preset emails and Preset SMSs that you have pre-prepared. See the related support articles for further information about creating Preset emails/SMSs. Note that it is only possible send a communication to the contact, child (or the child's parent/s), booking contact or giver being processed - the Send email/SMS action cannot be used to send a communication to a different person, a User or a User Group. Unwanted actions can be deleted by pressing the X on the right-hand side of any action in the list. We do encourage you to avoid what we call the "Monster Flow" - the Flow that attempts to do everything in the life of your church in a single Flow! Instead, consider breaking a lengthy Flow down into several shorter Flows. Doing so will reduce the risk of a person getting stuck at one stage preventing them from progressing to other stages until that stage is complete. Remember, a person can be added to multiple Flows and therefore be processed through your different admin processes simultaneously. You can even use the Add to flow action to add a person to other Flows while still retaining and processing them in the current Flow. For example, if your newcomer integration processes involve sending welcome information, assistance with finding a small group and an invitation to a newcomer event, why not break that into three Flows? After an initial welcome call in your "Newcomer" Flow it will be clearer whether that person wants assistance finding a small group and/or wants to come to a newcomer event - both of these welcome call follow up processes could take place simultaneously in two further Flows, rather than the person getting stuck in your "Find a small group" stage before you can move them on to your "Send a newcomer event invite" stage. Make sure that at least one Stage, and certainly the final Stage, includes a Move to stage > Flow Completed action, so that people can be processed out of the Flow when they are finished. You may also find it useful to record the date of a person's completion of your Flow processes with an Add key date action. In this way you'll later be able to use Smart Tags or the Key Dates/Key Dates Missing reports to identify those who have completed (or not completed) certain Flows. Finally, click Save Changes before navigating away from the Add flow page. It may be helpful to now test your new Flow by adding yourself to the Flow and processing yourself through each stage to check the user experience that your users will have when they are processing individuals or groups of individuals through the Flow. You may also find you need to adjust the timings of due dates between Flow stages to cater more realistically for your busy users or busy people that are being processed - sometimes the timings of when we would like actions to happen don't always follow our preferred plans! In the next section we'll explore how to add people to a Flow and then how to process people through Flow stages. As explained above, Flow overseers can be assigned when creating a Flow from the Flow "Edit" page; however, it is also possible to manage Flow overseers from the Flow "View" page. When viewing a Flow, notice the Overseers section at the top of the page, and the option to Add overseer. For each assigned overseer, the cog actions menu includes options to Delete the overseer and View changes. Located at the top of every Flow is the Add to flow button. Add contacts, children or givers to a Flow directly from their profile page in the respective module - select Add to flow from the Add drop-down button menu at the top of the profile page. From the Tags section of the Address Book, Children or Giving module, use the Add to flow action on the Add drop-down button menu at the top of a tag page. This option is available for both fixed tags and smart tags. This option also applies to the Key Dates sections of the Address Book and Children modules. When viewing the list of Invitees, Sign-Ups, Check-Ins for an event in the Calendar module, use the Add to flow action on the Add drop-down button menu at the top of the list of people. In all modules when viewing a report that includes people in the report's results, use the Add to flow action on the Add drop-down button menu at the top of the report. 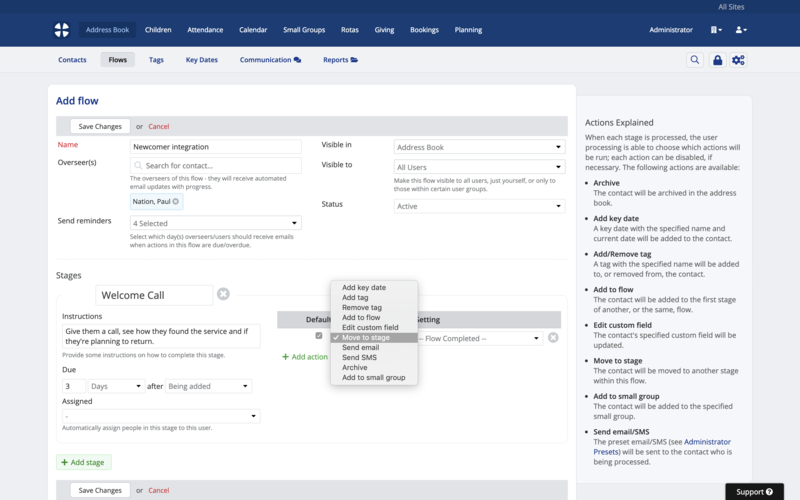 Wherever a user is accessing the Add to flow action, they'll be given the option to select which Flow and Stage they wish to add the selected people in to. A scrollable list of all the people to be added is provided. The Search option can be used to add further individuals. People can also be removed from the selection. Click Add to flow to add all the selected people to the Flow. Whenever you add individuals or groups of people to a Flow, you'll receive a feedback message confirming the people being processed, so you'll always know which people were added, and which people weren't, and the reason why. Note that it is not possible to add people who are already in the Flow. You can easily remove a person from a Flow by clicking the action cog menu on the right-hand side - select Remove. Where you have need for multiple, similar Flows; rather than creating each Flow from scratch, it is possible to duplicate an existing Flow. Duplicating a Flow will duplicate all Flow settings, stages and actions, but not the people who are in the Flow being duplicated. Flows are a User-only function - requiring a user to log in to ChurchSuite in order to process people and run actions for a Flow stage; therefore Flow reminder notification emails are sent to a user's email address; not the email address of the contact linked to that User. Flow reminders are therefore not recorded in the linked contact's communication log, but in the User's communication log. When viewing the Flows section within the Address Book, Children, Giving or Bookings module, users can view an overview of the number of people in each Flow, distinguishing the number people who have pending (grey), due (green) and overdue (red) actions. The View can be switched between Active and Archived Flows. Clicking through into a Flow will display a list of people in the Flow for the module being viewed, and the Stage that each person is at. For each person in the Flow, notice the Status and Due date indicating when they next have actions due to be processed. Note also the action cog menu options to Remove the person from the Flow, or to Move back the person to the previous Stage. Flow tracking data is maintained for each person as they are processed from stage to stage. Tracking information for those who have completed a Flow can be reviewed using the Flow Completed report in the module's reports section. If a person is removed from a Flow (rather than processed out of a Flow), their Flow tracking data is deleted. See the section later in this article for "Flow Reporting". As each person's Stage actions become due, click to Process their actions. A pop-up page opens displaying the person's contact details, Notes history, the Flow instructions, and the Actions that can be processed for the person. Users can add Notes in the Process window - ideal for adding details of phone conversations or follow up needed. Users can also click Change to amend the Due date, perhaps to postpone processing without running any actions. Be sure to click Save before closing the process page (see example below). You can also change the Assigned user, perhaps to delegate the person's actions to another user - that new user will receive Flow notifications when their tasks become due or overdue. The assigned user will remain assigned throughout the remainder of the Flow unless the user Assigned is changed. In the example above, notice that the default Stage actions are pre-ticked, but you can change the selected actions to be processed, and where appropriate, set the action's options to be assigned when the actions are run. Click Run Actions to process all the selected actions - the process window is automatically closed and the user is returned to the list of people to be processed for the Flow. 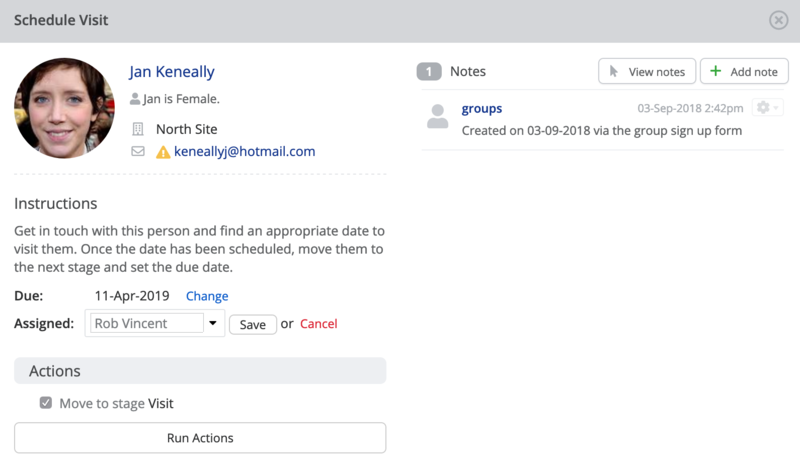 When viewing a person's profile page in the Address Book and Children module, details are provided in the meta information on the right-hand side of the page summarising which Flows the person is in, along with the Stage and due date of their next actions. Clicking through from the Flow meta information on person's profile page will open the Flow process window for that person. Ordinarily, people added to a Flow will be assigned to the user specified as Assigned in the Flow's settings. In the example below, people added to or processed into the "Schedule Visit" Stage will be automatically assigned to a user called Lindsey. In other words, the Flow's Assigned user is assigne by default at each Stage, and the assigned user will receive flow reminder notifications when a person's Stage actions become due or overdue. However, when processing a person in a Flow, the Flow's default Assigned user can be changed - perhaps to delegate the processing of a particular person to a different user. In doing so, the new Assigned user will take priority over the Flow's settings and the new user's assignment will continue for that person throughout all the subsequent Stages of the Flow - either until that new user is either unassigned, or they as assigned to another user. Essentially a custom assignment always overrides and take priority over the Flow's settings. This feature has many uses. For example, you may have a welcome Flow where newcomers add to the Flow with no user Assigned, and they are then manually Assigned to a particular pastor or welcome caller. That person will continue to be assigned to that user until they are manually unassigned or reassigned; irrespective of any default assigned user set in any of the Flow's subsequent Stages. When an Assigned user is manually removed for a person, without an alternative user being assigned, that person will resume being assigned to the Flow's default Assigned users as they are processed into each subsequent Stage. In this way, you can manually assign a user to a person for some Stages of a Flow, manually remove that assigned user, and the person will revert to be assigned to the user specifried in the Flow's settings as they are processed into subsequent Stages. In addition to processing individuals through a Flow, you can easily "batch process" multiple people within a Stage, making processing of actions for multiple people much quicker. For a Flow Stage, select the people to be batch-processed by ticking the checkbox to the left of their name in the list; then select Process from the drop-down Actions menu. The batch Process window opens, listing all the Selected people, the Stage instructions and actions to be processed. As with processing individual contacts, users can Change the Due date and the user Assigned to the stage. 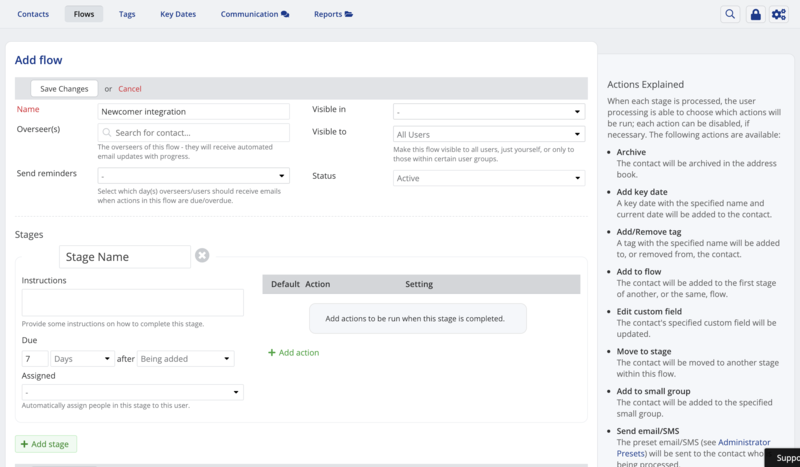 The Stage's default actions are pre-ticked, but you can change the selected actions to be processed, and where appropriate, set the action's options to be assigned when the actions are run. Click Run Actions to process all the selected actions for all the selected people - the process window is automatically closed and the user is returned to the list of people to be processed for the Flow. If no Actions are selected, the person will remain at that Flow Stage. If you find that people are not moving Stages in a Flow when you process them, check to ensure you have added a Move to Stage action to each Stage in your Flow. 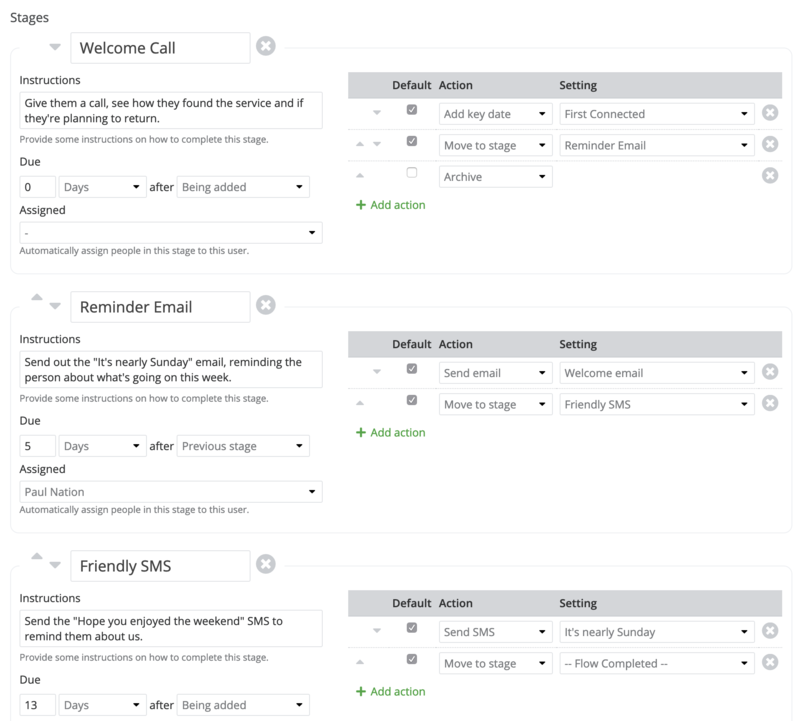 While Flows allow you to easily send Preset emails and SMSs as a Process Action, did you know that you can personalise those communications before you Run Actions and send the message? In the Process window, simply click the Personalise button next to any Send email or Send SMS actions. This opens the Preset email/SMS allowing you to personalise it prior to it being sent. The Flow Completed report in the module's Reports section is great for helping you analyse the tracking data of people processed through each of your Flows. Use the report's filters to select a Flow and the range of Dates within which people were processed. For each contact in the report results, the date they completed the Flow is shown and the total number of days each contact was in the Flow for. Clicking on the Days in Flow opens the Flow Action History for that person showing the complete tracking history from stage to stage, the user that processed them and the date and time the actions were run. Note that the report only includes people that have fully processed through the Flow. People that have been removed from the Flow will not be included in the report's results - the tracking data is deleted when the person is removed from the Flow. You can easily communicate with all people in a Flow Stage using the Communication button located at the top of each Stage.